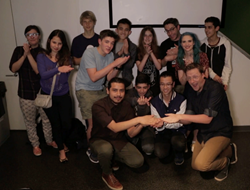 Teens Remix Hollywood With The LAMP at "Break the Trailer"
The teens, students at the United Nations International School, met at the Sony Wonder Technology Lab for two workshop sessions in which they explored the purpose of movie trailers, how they are constructed and how they have changed over time. The students then broke into pairs and created original movie trailers based on video clips. Finished trailers (available here) ultimately commented on the homogeneity of box office hits and action movie franchises, as well as the ways in which women are represented. Others used familiar characters to construct entirely new stories for fictional upcoming films. “I think what’s the coolest about this project is that you get to create new things out of the old things that already existed,” said student Yifan Wang. The trailers were screened in the HD Theatre at the Sony Wonder Technology Lab for LAMP supporters as well as the families of the students. The screening also included a short film about the process of making the trailers, produced by SheKnows Media. The event concluded with awards voted on by the audience and a panel of judges consisting of Emily Anne Epstein (The Atlantic), Alia Jones-Harvey (Mayor’s Office of Media and Entertainment), Alejandra Ramos (AlwaysOrderDessert.com) and David Levinson Wilk (CrosswordsForCongress.com). The LAMP is currently working on documenting its “Break” workshops so that events can be held independently across the country. This documentation, called “Break-a-thon in a Box” is expected for release in early 2016. About The LAMP: The LAMP provides hands-on learning opportunities to at-risk and underserved populations so they can live, learn and thrive in the 21st century. Through partnerships with dozens of schools and nonprofit organizations, The LAMP teaches media literacy, digital citizenship, critical thinking and basic production skills for a variety of media forms. The LAMP also offers professional development workshops for educators as well as family programming, in addition to free online tools such as the MediaBreaker and LAMPlit resource guides. More information at thelamp.org. Secondary School for Law: Final PSA Projects!